Definition: The Performance Appraisal is the assessment of the employee’s job performance against the benchmark previously set for the categories such as output, leadership, teamwork, versatility, supervision, etc. Management by Objectives: This concept was given by Peter.F.Drucker, according to him, the performance of an employee can be assessed on the basis of the targets achieved by him as set by the management of an organization.Firstly, the management sets the goals and communicate the same to the employees, and then the performance of an employee is compared against these set goals and is evaluated on this basis. In case the employee is not able to achieve the pre-established goals, then management decides on a new strategy or policy that should be undertaken for the accomplishment of unattainable goals. 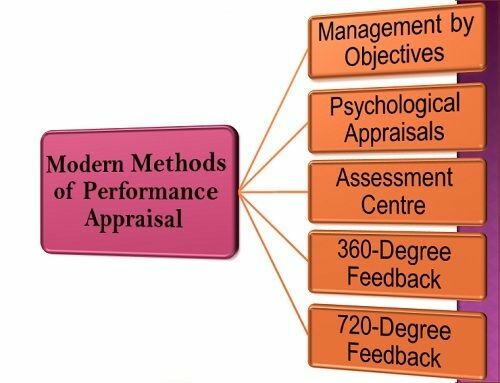 Psychological Appraisals: This is one of the most frequently used modern methods of performance appraisal, wherein the psychologist assesses the employee’s potential for the future performance rather than the past one. Under this method, the psychologist conducts the in-depth interviews, psychological tests, discussions with the supervisors and the reviews of other evaluations. This assessment is done to determine the intellectual, emotional, motivational and other related characteristics of an employee that is necessary to predict his potential for the future performance. Assessment Centres: The assessment center is the central location where the managers come and perform the job exercises. Here the assessee is requested to participate in in-basket exercises, role playing, discussions, computer simulations, etc. Where they are evaluated in term of their persuasive ability, communication skills, confidence, sensitivity to the feelings of others, mental alertness, administrative ability, etc. This entire exercise is done under the trainer who observes the employee behavior and then discusses it with the rater who finally evaluates the employee’s performance. 360-Degree Feedback: It is a feedback method wherein the details of an employee’s performance is gathered from other stakeholders such as superiors, peers, team members and self. In this method, the employee is asked about himself, i.e. what he feels about his performance, and then accordingly he can realize his strengths and weaknesses. Also, the peers or team members are asked about assessee’s performance through which the employee knows about what others feel about him and can overcome his disbeliefs if any. Thus, this method is used to have a detailed evaluation of an employee from all the perspectives. 720-Degree Feedback: This is an another feedback method, wherein the assessment is done not only by the stakeholders within the company but also from the groups outside the organization. These external groups who assesses the employee’s performance are customers, investors, suppliers and other financial institutions. It is one of the most crucial modern methods of performance appraisal because this is the only group that determines the success of the organization as a whole. Nowadays, companies use the modern methods of performance appraisal which have a broader scope than the traditional methods and provides a more accurate and comprehensive evaluation of an individual. Please, endeavour to add the name of author and date. The author is Megha M. and it is published on 25th October 2018.